Steven Devine: Exquisite and exuberant harpsichord..
Steven Devine enjoys a busy career as a music director and keyboard player working with some of the finest musicians. 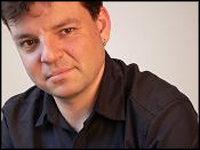 He made his London conducting debut in 2002 at the Royal Albert Hall and is now a regular performer there - including making his Proms directing debut in August 2007 with the Orchestra of the Age of Enlightenment. He has conducted the Mozart Festival Orchestra in every major concert hall in the UK and also across Switzerland. Steven is Music Director for New Chamber Opera in Oxford and with them has conducted performances of Purcell's Dido and Aeneas, Mozart's La Finta Semplice and Il Re Pastore, Stradella's Il Trespolo Tutore, Rossini's Le Comte Ory, Handel's Xerxes and Tamerlano, Arne's Artaxerxes, Galuppi's Il Mondo alla Roversa. He has directed the first performance of the newly-acquired score of Cavalli's Erismena and Sallieri's Falstaff with the same forces. For the Dartington Festival Opera he has conducted Handel's Orlando and Purcell's Dido and Aeneas. Since 2007 Steven has been the harpsichordist with London Baroque in addition to his position as Co-Principal keyboard player with the Orchestra of the Age of Enlightenment. He is also the principal keyboard player for The Gonzaga Band, Apollo and Pan, The Classical Opera Company and performs regularly with many other groups around Europe. He has recorded over thirty discs with other artists and ensembles and made three solo recordings. His latest recording of Bach's Goldberg Variations (Chandos Records) has been receiving critical acclaim - including Gramophone magazine describing it as "among the best". Another volume of Bach's harpsichord works is in preparation. Steven is a regular member of the OAE education team, Professor of Harpsichord and Fortepiano at TrinityLaban Conservatoire of Music and a visiting teacher, adjudicator and examiner for many other institutions. He is also Director of Development for the Finchcocks Collection of historical keyboard instruments, Kent. You can find out about Steven's other work with Kate Semmens on their duo page. Steven Devine lives in Kent, England. Tagged as: Classical, Baroque, Classical Period, Instrumental, Composer: George Frideric Handel, Harpsichord, Composer: James Nares, Composer: Johann Christian Bach, Composer: Joseph Gibbs, Composer: Joseph Kelway, Composer: Thomas Arne, Composer: Thomas Gladwin.